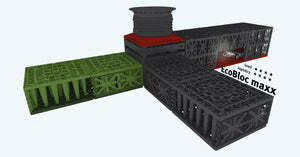 Rainwater Attenuation & Soakaway Crates | EcoBloc Maxx – Freeflush Rainwater Harvesting Ltd. 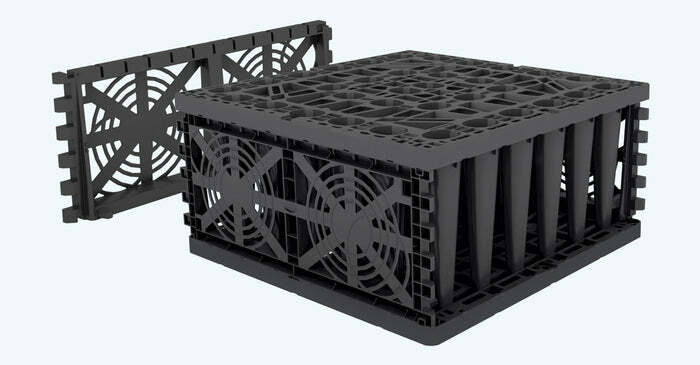 This below ground rainwater EcoBloc Maxx attenuation crates are an excellent solution for drainage areas for which SUDS . 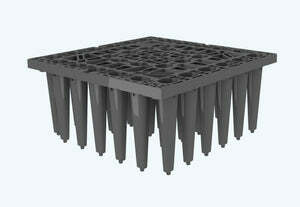 Perfect for areas where infiltration is possible due to due good drainage conditions (sand, silt, gravel etc.). If you do not have these conditions please see our attenuations tanks. The EcoBloc Maxx is suitable for vehicle loading. This package provides the perfect solution to satisfy planning and building control. Infiltration rate of soil/soil type: -m/ if the infiltration test has been completed if not description sand, silt clay etc. GRAF infiltration modules have three times the storage volume of a standard gravel infiltration ditch. One module therefore takes the place of around 1300 kg (1,4 tons) of gravel or a 50 m (164') drainage pipe. Since you don‘t have to excavate so much soil and enjoy great value for money compared with a standard gravel infiltration ditch, the GRAF modules save hard-earned cash! A durable product design ensures sustainability. The GRAF EcoBloc system and the Vario 800 flex shaft system for a service life of over 50 years. The modules are fitted simply, at speed and in various ways. They can be installed without heavy machinery – one EcoBloc Inspect flex module weighs just 8 kg (17.6 lbs), only 7 kg (15.4 lbs) for one EcoBloc Maxx unit. The GRAF EcoBloc Maxx has a gross volume of 225 (59.4 US gal.) and a reservoir volume of 219 (57.9 US gal.). With a reservoir volume in excess up to 97 %, it is a market-leading product. The EcoBloc variants and Inspect flex still offer a reservoir coefficient of 96 % despite their high load-bearing capacity. Even under very heavy loads, GRAF EcoBloc Maxx modules can be installed at a depth of up to 4 (13'1.4"). This means that up to 9 layers are possible. Please consult GRAF when the installation depth is greater than 4 .